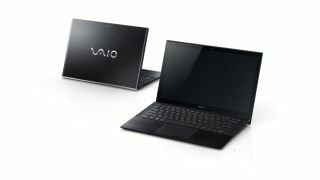 Sony is staking the ground for its Vaio Pro 11 and 13 Ultrabooks as the world's lightest touch capable models. While it's flagging up the claim, which it says was verified on June 5, as the major selling point, it's likely to be equally significant that Sony has joined the race to quickly release models with Intel's new Haswell Core processor. The manufacturer is hoping that the muscle from Haswell will combine with the light weights of the two Ultrabooks to lure buyers to go along with the £1,000 plus price tag. It may be ambitious, but on first look the Vaio Pro 11 and 13 stand a realistic chance of encouraging more users to pick up a machine running on Windows 8. Vaio Pro 11 weighs in at 870 grams while the Vaio Pro 13 is 1.06 kg. Battery life runs to eight hours on the Vaio Pro 13 and 11 on the Vaio Pro 11. An optional sheet battery can boost these figures to 18 hours and 25 hours respectively. The 11.6-inch and 13.3-inch screens have a full HD display, and Sony has drawn on its Bravia technology to include a Triluminous Display, along with X-Reality for mobile, which analyses each image and reproduces lacking pixels to optimise video quality. It is supported by Intel HD Graphics 4400. Both models also come with near field communications.